Your next vacation could be on your own private jet fully stocked with some of the best Macallan has to offer. 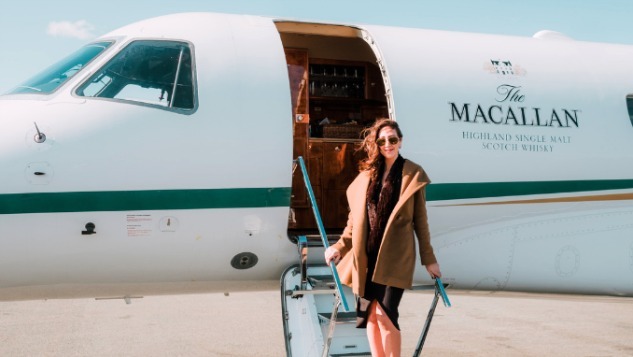 The distillery has partnered with Monarch Air Group to offer The Macallan Masters Journey, a one-of-a-kind opportunity to take a private jet from New York to Miami for an experience you’re likely to be talking about for years to come. Whisky fans board the jet in New York at Teterboro airport, along with whomever else they’ve decided to invite along for the journey. Once on board, you’ll be able to taste through some of Macallan’s portfolio in the air. When you land, you’ll then be transported to your own private chartered yacht for dinner prepared by your own private chef where, inevitably, even more whisky will be enjoyed. The whiskies are all part of the Macallan Master Series: The Macallan Rare Cask, The Macallan Reflexion, The Macallan No. 6, The Macallan M.
You can decide how many people you’d like to travel with you, how big the plane and yacht are, the dinner menu, and of course, what whiskies you’d like to enjoy. Guests can also ask for Raquel Raies, National Brand Ambassador for The Macallan, to join you on your journey and take you through a best-in-class tasting of The Macallan whiskies. All that exclusivity comes at a price. Macallan says the trip has an estimated cost of $46,000, although pricing will vary depending on the desired parameters of the experience. Trips also need to be taken between December of this year and March 2019. For more details visit The Macallan.